Author Novella Carpenter, center, oohs over what's growing in Appalachian's Edible Schoolyard during her campus visit Sept. 6-7. She wrote this year's summer reading selection for freshmen, "Farm City: The Education of an Urban Farmer," and spoke at Convocation. Just a few steps from one of Appalachian State University's residence halls, the last of the season's tomatoes and squash ripen on the vine. It is late summer, and students are exploring nature and getting a taste of where food comes from. 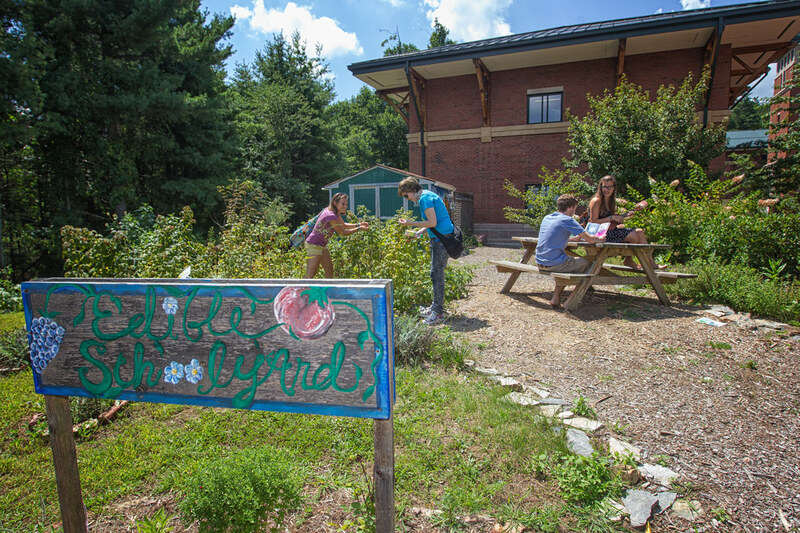 This is Appalachian's Edible Schoolyard, a half acre or more of vegetables, fruit trees and perennials where students get their hands dirty and their minds opened. The project started in 2006 as a way to landscape the newly constructed Living Learning Center, but it has grown into much more. 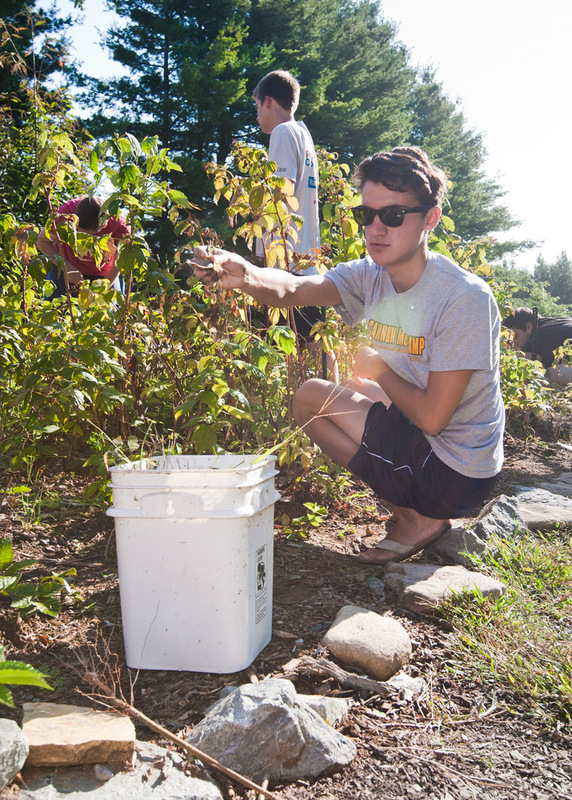 A variety of courses and campus clubs have devoted hours to developing the organic garden and building its greenhouse and compost pile. Humanities courses such as Eco-art and Healing use it a metaphor for change, while biology and sustainable development courses use it for research, instruction and demonstration. And, they get to eat the fruit of their labors. David Haskins from Wilmington pulled weeds in the garden one morning with his Contemporary Green Living class. 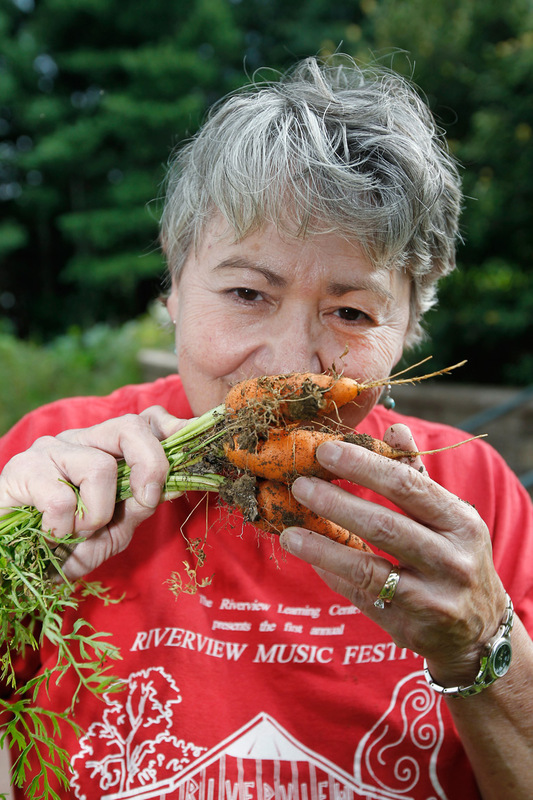 "I like the idea that I can work in a garden and the entire community can benefit from it. The better taken care of the garden is the more it can produce, and each little part makes a difference," he said. 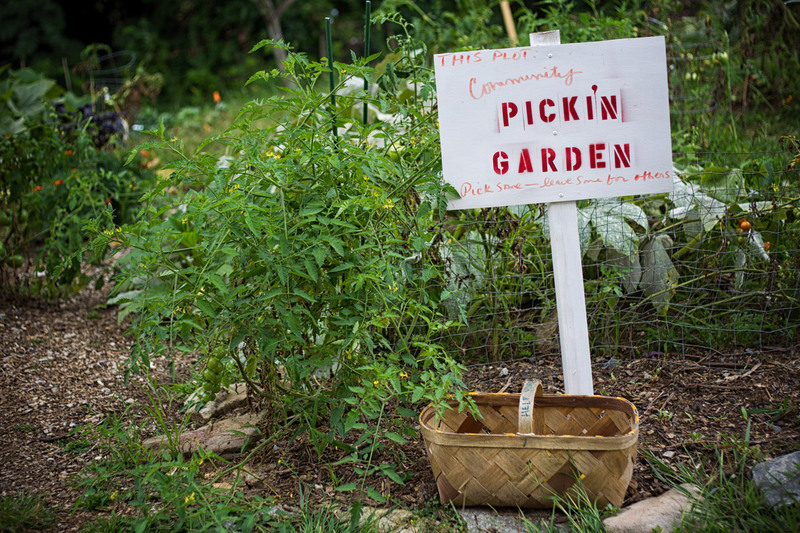 "Many people are separate from nature, the food source, divinity, happiness," said Laura Rainville, an August 2012 graduate who tended the garden and created educational signage for the plants this summer as part of her sustainable development degree. 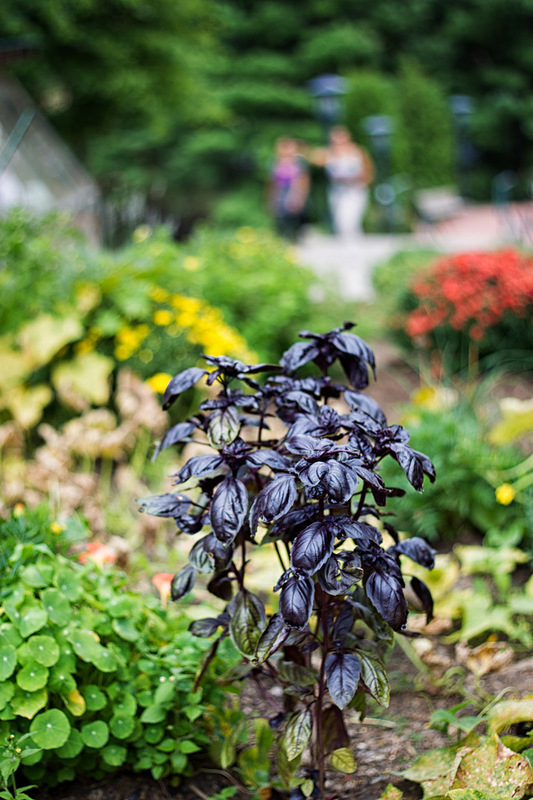 Having the Edible Schoolyard on campus is "important," she said, because it reconnects people to the land and source of life. Plus, "the hands-on activities are groovy." Before American society became fast paced and consumer driven, gardening was often the norm to keep a family fed. Many of today's students may not know how food is grown. Patience Perry is assistant director of Watauga Global Community, one of Appalachian's residential learning communities. She said she realized this trait firsthand in discussions as part of this year's summer reading program in which freshmen read Novella Carpenter's "Farm City: The Education of an Urban Farmer." 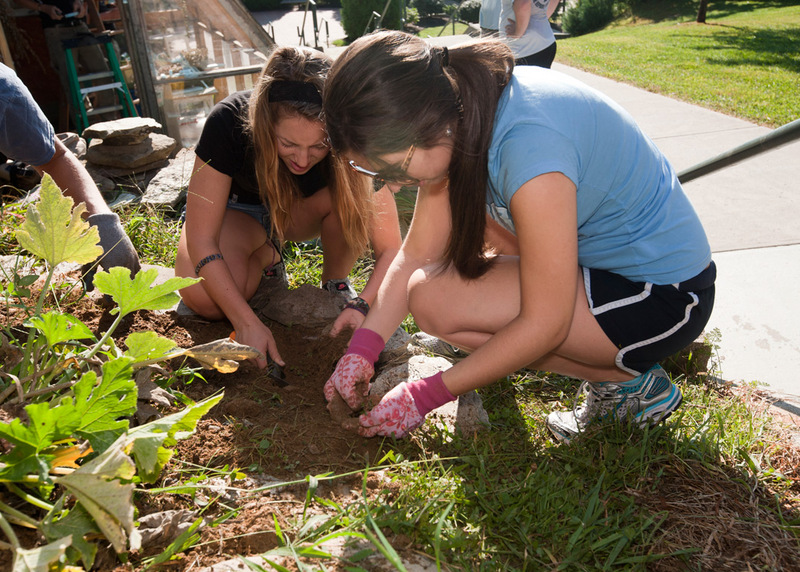 "We have 92 freshmen in Watauga Global Community and at least 70 percent of them had never touched a garden or had a connection to one through their family or community," Perry said. "So, we walked around the Edible Schoolyard, tasted the raspberries and had a real sensory experience. They were fascinated, curious. Many said they didn't connect to the text until they walked through the garden." 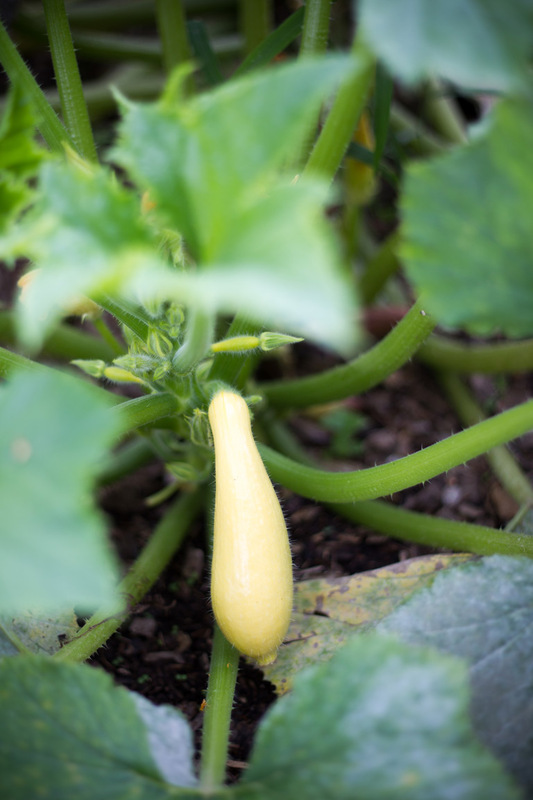 "I have never gardened with edible crops before so that was cool," said Kayla May, a freshman from Louisville, Ky., and a member of the Contemporary Green Living class that spent a morning in the garden. She plans to return because, "I really enjoyed working in gardens," she said. "It is a relaxing hobby to do in the midst of the chaotic school day." Since the Edible Schoolyard began, the university has offered an adopt-a-plot program to the local community where they can grow their own produce. The Edible Schoolyard has hosted workshops on topics such as annuals, perennials, soil fertility, greenhouse construction and composting, and it has welcomed area school groups and pre-school children to visit and learn. Tasting is encouraged, unless the plants are in a plot reserved for a family. "Organic produce is so expensive to purchase, but it's inexpensive to buy seeds and grow it yourself. You can do it for pennies," said Debbie Bauer, garden manager and a staff member in the university's Appalachian studies program. She also has her own adopted plot. "After 5 p.m., there is a lot of activity with people working in their garden plots, and students come out and want to help. They talk positively about the garden. They say 'Here I am living in a dorm and look what's in my backyard!'" Freshman Sierra Santos sees beyond the produce. "My experience in the Edible Schoolyard reminded me that gardening is more than just 'pulling weeds' and 'putting a shrub in the ground,'" she said. 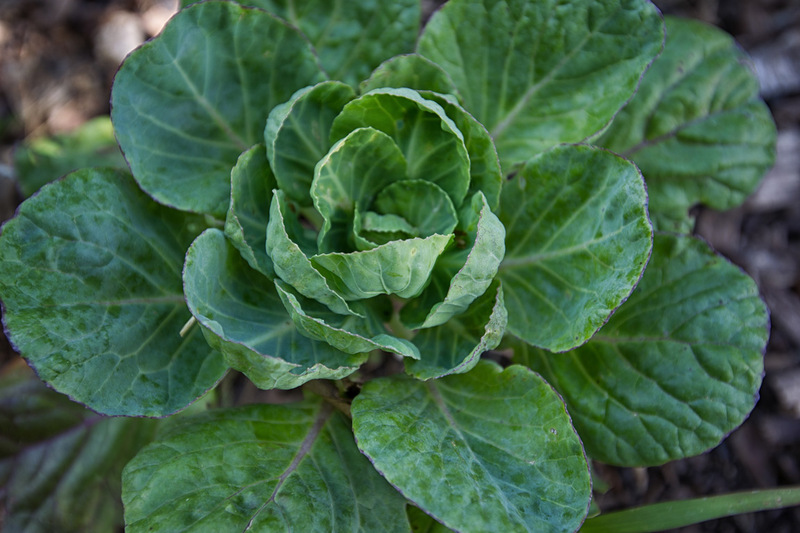 "Gardening allows you to flourish as an individual within a well-rooted community of all different kinds of 'buds.' 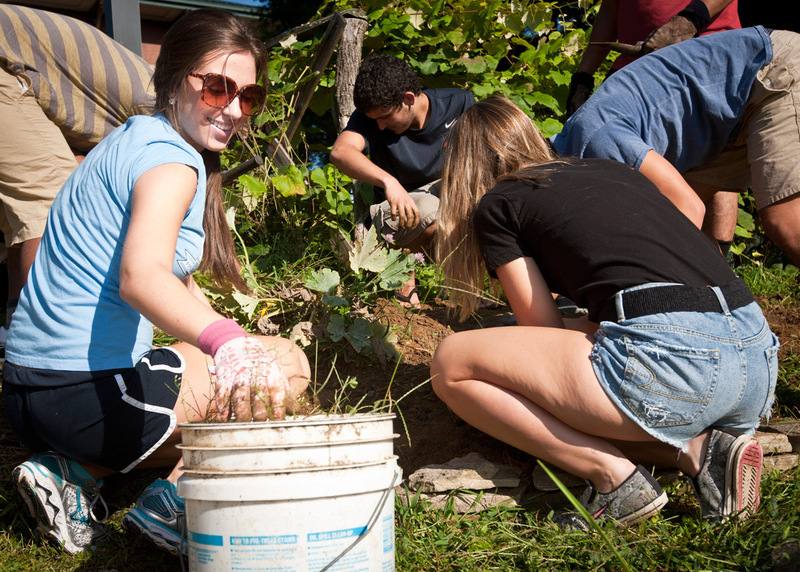 As the blossoming students of Appalachian, we are all gardeners who have the ability to plant seeds of change." 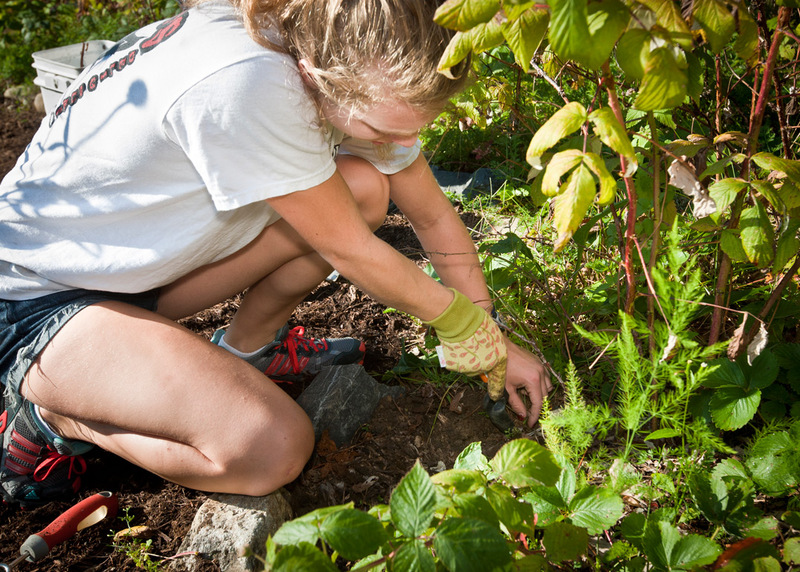 "Putting back time to what the earth gives us is a euphoric feeling," said freshman Lindsey Giglio, pictured, who recently worked in the garden. Freshmen Sierra Santos, left, pulls weeds with classmate Kayla May. "We are all gardeners who have the ability to plant seeds of change," Santos said. This is the Edible Schoolyard gallery.